The first thing I noticed when I moved in to my new neighborhood last year was the complete lack of natural foods and organic produce at my local supermarkets. What I did find, however, was an assortment of Spanish and Polish goods. So while I now have to import healthy organic veggies, I have also discovered my favorite non-organic, probably totally bad for you, absolute over-the-top muy delicioso chipotle sauce. Who ever La Morena is, she’s welcome in my kitchen any day! My new favorite sauce is the perfect flavor perk for everything from shrimp tacos, to fiesta chili or eggs. Hopefully you can find some at a bodega near you. 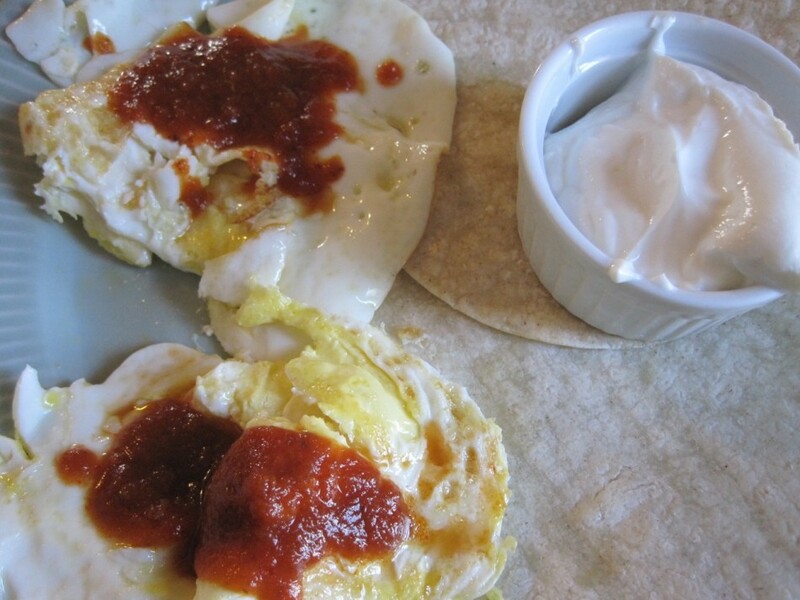 This quick and easy 3 minute breakfast consists of fried eggs, corn tortillas, chipotle sauce and greek yogurt. Simply fry up a couple of eggs. While you are doing so, in another frying pan, warm the tortillas one at a time. Drizzle a spoon full of unheated sauce on the egg when done and serve. To eat, just wrap and egg in a tortilla, smear on a dollop of yogurt and enjoy your breakfast tacos. February 20, 2011 | Filed under breakfast, brunch, gluten free, snack and tagged with breakfast, chipotle, eggs, quick, tortilla, yogurt.